Lentils and tahini have long held a place in my heart, but I had never tried them together until my eyes were opened to the world of Ottolenghi this winter. After receiving his cookbook Plenty as a Christmas present from my sweet husband, I quickly realized I needed more – Plenty More, in fact (forgive the pun), his cookbook which came out last autumn. I’ve already used about a full stack of post-its to mark all the recipes I want to try in the cookbook, but I knew immediately that the first I had to try was his recipe for crushed puy lentils with tahini and cumin. Ironically, it’s one of the more unassuming-looking recipes in the book, but I know from experience that tahini can elevate any dish into something truly special. It was love at first bite, and it was then that I decided to have my first giveaway on OSK – Plenty More is simply too good not to share. With bright, fresh flavors, this dish encompasses everything I love about Mediterranean food. The cumin gives it an earthy flavor, which contrasts so well with the zest of the lemon and the nuttiness of the tahini. With all of the complex, varied flavors in this dish, you would think that it would be difficult to make and would require a long list of ingredients. But it’s the opposite, in fact – you can have this ready in about 30 minutes using primarily pantry ingredients. And with hard-boiled eggs and some pita on the side, it turns out to be the perfect well-rounded meal. I am so excited to give away a copy of this cookbook. Ottolenghi’s recipes are incredibly creative, fresh and colorful. He combines flavors that I’ve never seen together before, and he pulls it off every time. And from the beautiful photography to the way the book is organized (each chapter is devoted to a different cooking method – simmered, grilled, roasted, etc. ), this book is just a lot of fun to page through. Giveaway details: one lucky reader will receive a copy of Yotam Ottolenghi’s cookbook, Plenty More. The winner will be chosen on March 9. Use the box below to enter! This giveaway has closed. Congratulations to Claire for winning! Cook the lentils according to package directions; drain and set aside. While the lentils are cooking, add the butter and olive oil to a large pan and place over medium heat. Once the butter has melted, saute the garlic and cumin and cook for about one minute. Add the tomatoes, three tablespoons of the cilantro, and the cooked lentils. Cook for about five minutes, stirring occasionally. Add the tahini, lemon juice, about 1 teaspoon of salt and some freshly ground black pepper. Continue to stir for about five more minutes. If the mixture is too dry, add 1-2 tablespoons of water. 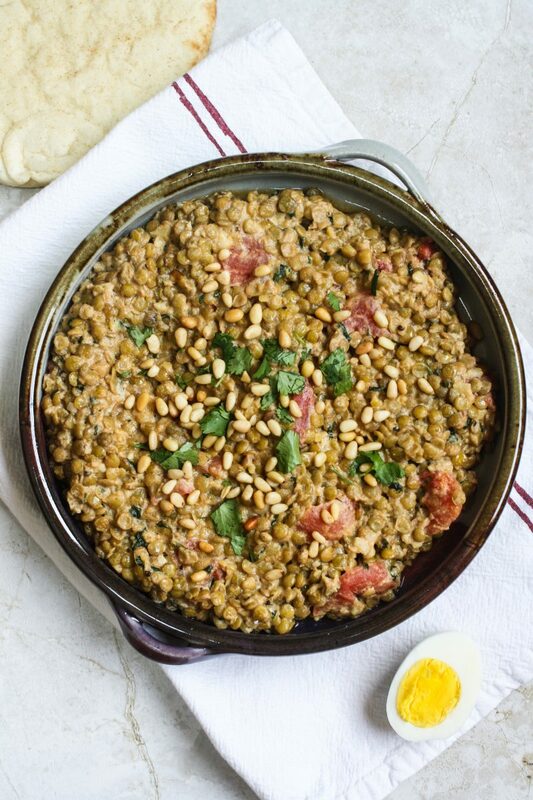 Serve the lentils on a flat plate and garnish with the paprika, pine nuts and remaining cilantro. Serve alongside the hard-boiled eggs and pita. I’m so excited to try this, Julia. It sounds rich, comforting and full of incredible flavors! What a sweet and attentive gift your husband gave you… he has good taste! I have Plenty and have yet to get Plenty More… but you know it’s on my radar. Everything I’ve made from Plenty has been so fantastic and memorable. It’s hard to imagine Plenty More will top Plenty, but I hear it just as exceptional! Crossing my fingers for a win on your generous giveaway! Thank you so much! 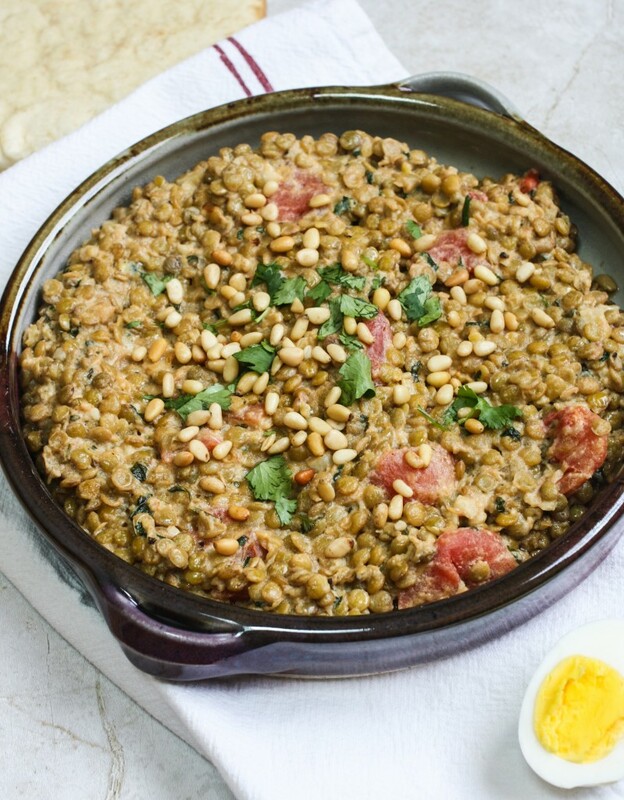 Oh man, these lentils look nothing short of perfection. I’m in love with Ottolenghi’s food too…he always has me swooning over his creative and unique pairings in recipes. I have his Jerusalem cookbook and never tire of looking at the photos and cooking from it. I love what he manages to do with ordinary vegetables and I’m sure Plenty More is full of more surprises. Thanks for the generous opportunity Julia! As one of the lucky samplers I can attest to how well the medley of flavors came together in this wonderful dish. Each one complemented the lentils perfectly. The egg was a nice addition, too — basking in the elemental saltiness. I love lentils, Julia and love finding a new twist on making them – so really looking forward to trying them with tahini. I received Plenty for Christmas and am planning on getting Plenty More – but maybe I’ll win it! Fingers crossed – thanks for the fun giveaway! I think you’ll really enjoy this recipe, Geraldine! And I know you’re a Trader Joe’s fan – have you tried their tahini before? It’s amazing…I could eat it with a spoon! i’m glad to have found this recipe. Lentils have been on my crave list for a few days now. Can’t wait to try. I hope you enjoy it, Kathy! Lentils are often on my crave list too! Thanks, Aly!! I am obsessed with tahini lately and want to put it on just about everything. I hope you enjoy this! I have Ottolenghi’s Plenty book and I love it! I really want to get Plenty More as well. And I just made a dish with lemon and tahini over the weekend but I would have never thought to add cumin. That sounds fantastic! I’m definitely going to give it a try! Isn’t Plenty a great cookbook? One of my favorites is his broccolini pappardelle with panko – you must try it out if you haven’t already! Thank you, Sarah! You’re right, this really is a comforting dish. I hope you enjoy it! Thanks, Stacey! I love finding new recipes on Pinterest. I hope you enjoy this dish!